Thomas was born in Big Stone Gap, Virginia. His mother, Betty, worked the graveyard shift in a Virginia coal mine for nearly 20 years while raising seven children, including his younger brother, Julius Jones. While in Appalachia, Virginia, his father encouraged the children to learn five new words per day, and made them read the front page of the newspaper, before they could read the sports section. Jones credits his parents with instilling the ambition and strong work ethic that he is known for in professional football. While playing for Powell Valley High School in Big Stone Gap, he led the team to back-to-back state championships in 1994 and 1995. He still holds the VHSL record for the most rushing yards in a season with 3,319. He broke his late uncle's (Edd Clark) single-game rushing record in 1994 (462 yards against John I. Burton High School). He also tied for most career touchdowns (104) with Terry Kirby. Thomas was featured in the January 22 (1996) issue of Sports Illustrated section, Faces in the Crowd. Jones attended the University of Virginia, and played for coach George Welsh's Virginia Cavaliers football team from 1996 to 1999. Through four years, he left his mark on the record books of both the team and the Atlantic Coast Conference (ACC). He ended his career at Virginia with eight conference and fifteen team records, including finishing as the Cavaliers' all-time rushing leader with 3,998 yards, eclipsing the previous mark of 3,389 yards set by Tiki Barber. His rushing total was the fourth highest in conference history. Jones also set the conference and school record for single season rushing (1,798 yards) and single season all-purpose offense (2,054 yards). While becoming the first player in ACC history to attain 200 yards rushing and 100 yards receiving in a single game, Jones set a single game school record with 331 all-purpose yards against the University at Buffalo. Setting an ACC record for 200-yard games, Jones finished with six 200-yard rushing performances. He finished his college career with 4,698 all-purpose yards, fourth all-time at Virginia. As a senior in 1999, Jones was voted as a consensus first-team All-American by The Associated Press, Football News, the Football Writers Association of America, Walter Camp Foundation, and The Sporting News. Finishing 8th in balloting for the 1999 Heisman Trophy, he was the first ACC consensus All-American running back since 1978 (Ted Brown, NC State) and third in league history. Jones led the conference running backs and receiving yards, amassed four 200-yard games, and finished third in the nation in rushing (163.5 yards/game) and all-purpose yards (186.7 yards/game). Thomas Jones was chosen by the Arizona Cardinals in the first round of the 2000 NFL Draft with the seventh overall selection. In his three years with Arizona he rushed for 1,264 yards and 9 touchdowns. He was injury-prone, however, and finished only one full season (2001) for the Cardinals. Up until the 2002 season he also was splitting time with running back Michael Pittman. Jones was traded in 2003 to the Tampa Bay Buccaneers. As a free agent in 2004, Jones received his opportunity to be a featured back, signing a multi-year contract with Chicago. In his first season with Chicago, he rushed for 948 yards and 7 touchdowns. After the season, Ron Turner took over as offensive coordinator and installed zone blocking schemes that utilized Jones's speed and ability to make quick decisions. Heading into the 2005 NFL season, Jones figured to return to sharing duty as the Bears used their top draft pick on running back Cedric Benson. However, a lengthy hold-out prevented Benson from pushing Jones for playing time. After starting the season with a poor performance against the Washington Redskins defense, Jones proceeded to recover with season statistics of 1,335 yards and 9 touchdowns. Jones amassed 61 first downs while averaging 4.3 yards per carry. A veteran with, at that time, six years league experience, Jones continued to see extended playing time to assist the offensive line with pass blocking for Rex Grossman. After the 2005 season, Jones fired his agent and hired Drew Rosenhaus in April 2006. Jones did not participate in the Bears’ voluntary off season program in 2006, opting instead to work out on his own, leading to Benson lining up with the first team during workouts. On July 26, Jones injured his hamstring during a physical at the Bears' summer camp; Lovie Smith announced Jones would fall behind Cedric Benson on the depth chart. However, on August 4, Benson injured his shoulder after colliding with Brian Urlacher during a routine practice drill, and Jones returned to his featured back position. The Bears’ two-headed rushing attack showcased both players during the 2006 season. Benson, at 5-foot-11 and 230 pounds, acted as a straight-ahead runner, whereas Jones used his quicker 5-foot-10 and 215-pound frame to find holes in Chicago's zone-blocking scheme to get through the defense. During the regular season, Jones gained 1,210 yards and Benson amassed 647 yards; both averaged over four yards per carry. Jones had four 100-yard performances during the regular season and continued to see an increased role in the passing game as Benson had not yet mastered pass protection. That year, Thomas and his brother Julius became the first brother tandem in NFL history to rush for 1,000 yards in the same season. During the 2006 playoffs, Jones rushed for 66 yards and two touchdowns on 21 carries en route to a 27-24 Bears’ victory over the Seattle Seahawks. The next week he rushed for 123 yards and two touchdowns on 19 carries in the NFC championship game against the New Orleans Saints, helping the Bears advance to the Super Bowl with a 39-14 win. Jones's 123 rushing yards against the Saints set a Bears postseason record. On a crucial drive late in the first half, after three stalled Bears drives ended in field goals, Jones ran the ball on every play of an eight-play, 69-yard drive and scored the Bears' first touchdown of the game. Jones was one of three college teammates who reunited in Super Bowl XLI. Jones, his teammate John St. Clair, and Terrence Wilkins of the Indianapolis Colts were roommates at the University of Virginia. In Super Bowl XLI, Jones finished with 112 yards rushing and 18 yards receiving, including a 52-yard run that marked Chicago's longest run of the season. Though averaging 7.5 yards per carry in the game, the Bears' only called 15 running plays in the 29-17 loss to Indianapolis. On March 5, 2007 the Bears traded Jones and their second-round pick (63rd overall) in the 2007 NFL Draft to the New York Jets in exchange for their second-round pick (from the Washington Redskins) (37th overall). Following the completion of the trade, the Jets signed Jones to a four-year, $25 million extension. Jones had his best season in 2008. Named the AFC's starting running back in the Pro Bowl, Jones scored 15 total touchdowns, including two via receptions, and rushed for 1,312 yards to lead the AFC. 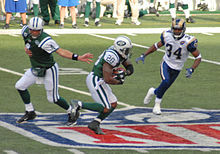 On October 18, 2009, in a game against the Buffalo Bills, Jones rushed for a Jets franchise record 210 yards and a touchdown, breaking the old mark set by Curtis Martin. However, the Jets lost 16-13 in overtime. On December 3, 2009, Jones reached 1,068 rushing yards for the 2009 season against the Buffalo Bills. This would mark the fifth consecutive season in which Jones has rushed for 1,000+ yards. On January 17, 2010, Jones converted a final minute 4th and 1 to lead the Jets to victory over the San Diego Chargers in a 2009 playoff game. The win ensured that the Jets would play the Indianapolis Colts in the 2009 AFC championship game. On March 1, 2010, the New York Jets announced that they would release Jones as of March 5, 2010 due to an upcoming contract bonus (all despite having a career-high season with 1,402 rushing yards) and talks with LaDanian Tomlinson. He was officially released on March 5. Jones signed a two-year contract with the Kansas City Chiefs on March 9, 2010. ^ "Jones still the one in two-back system". ESPN.com. ^ Zillgitt, Jeff (January 31, 2007). "Virginia teammates reunite". USA Today. ^ "Colts vs. Bears - Game Recap". ESPN.com. ^ "Thomas Jones is quietly putting together a great Career". PFT. December 4, 2009. Retrieved December 11, 2009. ^ "Jets Will Release RB Thomas Jones". newyorkjets.com. March 1, 2010. Archived from the original on March 4, 2010. Retrieved March 2, 2010. ^ Battista, Judy (March 1, 2010). "Jets to Cut Jones, the Latest Unemployed Running Back". The New York Times. Retrieved March 2, 2010. ^ "Kansas City Chiefs sign ex-New York Jets RB Thomas Jones to deal". ESPN.com. ^ "2000s All-AFC Teams". profootballwriters.org. ^ "AFC Player Rushing Statistics - 2008". ESPN.com. ^ a b "Thomas Jones Stats". ESPN Internet Ventures. Retrieved April 9, 2014. ^ "Former NFL player wants brain studied - CNN.com". CNN. February 2, 2013. ^ Uribarri, Jaime (January 16, 2013). "Thomas Jones to donate brain to science as former NY Jets RB fears effects of repeated concussions during NFL career". Daily News. New York. ^ "Thomas Jones: pain, power, pride - WindyCityGridiron.com". Windy City Gridiron. January 10, 2017. ^ "Former Bears RB Thomas Jones stars in 'Straight Outta Compton'". CSN Chicago. Archived from the original on August 20, 2015. Wikimedia Commons has media related to Thomas Jones (American football).